The Bionic Dolphin is a remarkable submersible hydrofoil that can cruise across open water at speeds of up to 80 miles per hour. Underwater? No problem for the NoLand Bionic Dolphin, which can travel underwater at speeds of 40 miles per hour. It's starting to look like science fiction writer David Brin's whale waldoes might be possible. 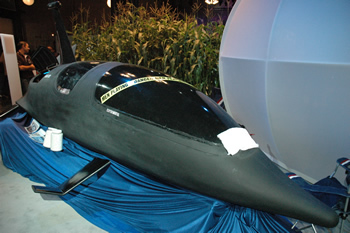 I saw the Bionic Dolphin at NextFest 2006, a technology exposition hosted by Wired magazine in NYC's Javits Center. 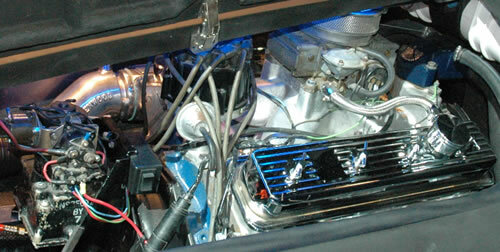 Surprisingly compact, the device is powered by a 425-horsepower Corvette engine (pictured below). The Bionic Dolphin is built to withstand rough seas; it's skin and structure are built of a composite of materials including Kevlar, used in bulletproof vests. The custom-built vehicle cost about $350,000 to build, but two-seater versions would probably sell for about $120,000 in production. Its inventor, Thomas "Doc" Rowe, hopes to place the vehicle in resorts by 2007. Be sure to read the article about Robert Heinlein's waldo, the science-fictional origin of this real-world device. Update 02-Jan-2017: Check out the Search for the Silver Whale, or Under the Ocean in the Electric Dolphin (1902). End update. Read more about the Bionic Dolphin. Thanks to reader Erik Nodacker for the story connection.